The Audi A6 launch happened Super Bowl night where they promoted their The Chase commercial, complete with full-on action sequence scenes from The Transporter film star. It was adrenaline, alpha male content at its best. Car shot --> Flash to Driver --> Car Jumping --> Audi badge shown --> driver’s face full of intensity, hand clinching steering wheel action. The online presence was anything but. Sure you could click on a small box in the lower right to see how The Chase was filmed, but Audi’s A6 website was all about setting the brand up as the luxury make for this decade. Audi has been having some fun with its competitors’ comical stereotypes (see Meet the Beckers post.) Their assault on Mercedes, BMW and Lexus continues as the Audi sells itself as the brand that has been plodding to rein the luxury car battle. 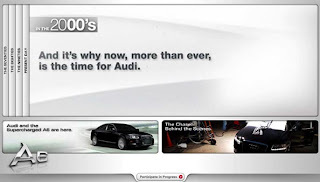 The site’s content is divided into decade slices: 70’s for Mercedes luxury, 80’s for BMW yuppies, 90’s for Lexus badged Toyotas, and of course Audi as the “Present Day” current brand innovator. There is one flaw in the message. If Audi is for this decade, the 2000 decade is coming to a close. So what is the luxury make for the 2010 decade? Hyundai? Message flaw aside, Audi does provide some fun messaging as its products are truly rivaling its German neighbors. The new A6 and recent A5 debut and A4 refresh, not to mention R8 supercar, are all giving the luxury leaders some strong product competition – yet the sales numbers still need to deliver the goods. The product is ripe. Is the marketing effort? Let’s evaluate the Super Bowl ad. Josephe Jaffe rips the Super Bowl ad strategy to shreds in his seminal work Life After the 30-Second Spot. A bit of a rough, arguably simplified and even flawed assessment of the Super Bowl audience, but Jaffe’s point is to mock the reach of this single day event. The reality is the likely to purchase affect is fairly poor considering the cost to participate in the day’s hype. Besides, it’s more about the hype generated than the ad running at game time and unfortunately for Audi no one noticed their spot. It got lost in the mix and that’s a bad result. The A6 does lag behind the BMW 5-series (45k units), Mercedes E-Class (38k units) and Lexus GS (15k units) with 12,000 units sold in 2008, source Automotive News. But is the issue an awareness issue or something else like quality, brand loyalty from competitor owners or product shortcomings? I wish I could say awareness was the issue and Audi is addressing the awareness through one of the few mass media days left in our culture, but the A6 is a well-known entity in the segment. The bigger issue is probably the brand’s association with Volkswagen and a history of poor quality numbers and the stayed, bland styling the car has had up until the recent model; though, even the styling isn’t a huge departure from the exiting model design. Worse is the TV ad was entirely not integrated with the campaign for the A6 which is trying to message Audi as the luxury car for this decade of luxury consumers. Chase scenes shout more 1970’s Bullit and less present day. It seems to this marketing person that Audi could’ve better spent their ad dollars by not participating in the Super Bowl TV spot markup. They would’ve reached their audience better through targeted ads. Besides the A6 campaign still needs to decide if it is going for the stunt driver crowd or trying to define itself as the car of the “Present Day”, neither position sounds compelling which is probably part of the reason for the lack of consistent messaging – someone at Audi still doesn’t like the campaign idea I’d venture to guess.